Today we’re looking at another example of true Utah Mormonism. Brigham ruled his kingdom with an iron fist, and taught that his words were scripture. If someone had the audacity to cross his imaginary line of rules, a price would be paid. For Mormons that meant the loss of a forever family. This LDS reference is one of the reasons why Brigham earned himself the nickname, ‘Breed ‘em Young’. 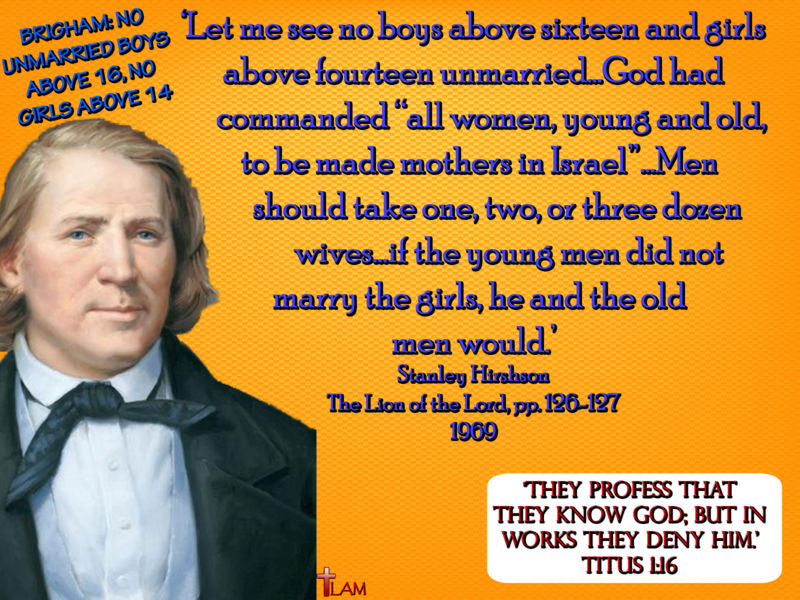 While the legal age of marriage has risen since the days of Brigham, it hasn’t changed all that much. The minimum age of marriage is now 15, although Utah law websites show that 14 yr old kids can still get married with parental consent (the same law applies to those who are 15-18 yrs old). To summarize: Everything is pretty much the same for LDS members in the 21st century, especially those in my beloved Utah. If you don’t get married in the temple, you have no true salvation with a forever family. The heartache of this was seen in a comment we received on our site the other day. A woman wrote in, and talked about the dead end road she faces by not being married in the temple which negates her chances of a happy existence in a Mormon heaven someday. Be sure to pray for her and other members, who’ve bought into these horrific lies – this is absolutely heartbreaking. True salvation is found in Christ Jesus, and Him crucified. He did this for all of us, not a select few, and He didn’t pay the price for sins in the Garden of Gethsemane, but on the cross at Calvary! If the death of Jesus can’t get you into heaven, why did He die on the cross?